A poet of crime writing, Irishman Connolly brings back quirky hero Charlie Parker in this latest instalment in a superb series. There's a fine line (a semipermeable one at that) between the living and the dead in John Connolly's supernatural-tinged private eye series. In the previous instalment, Charlie Parker nearly paid the boatman and crossed the Styx himself, and A SONG OF SHADOWS sees the trouble-magnet detective slowly recuperating in small-town Maine. Battered and bruised, Parker has isolated himself at a beach house arranged through a friend. Daily shuffles along the sand are about all he can muster, and his presence is tolerated rather than welcomed by the local sheriff and townsfolk of Boreas, an historic seaside settlement. Every day Parker inches further: his recuperation, like the town, moving at a snail's pace. But Parker is not alone, and when the body of an obsessive Nazi hunter washes ashore and a neighbour strikes trouble, the near-dead Parker must summon all his resources to battle modern foes whose darkness was forged by an historic evil. It may be 70 years since the end of the Second World War, but the Holocaust still echoes strongly in this close-knit part of New England, with its intertwined German and Jewish roots. 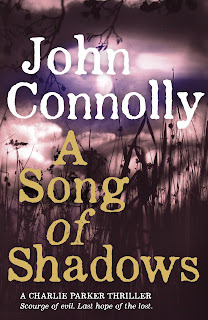 Connolly adroitly blends noir and paranormal in this superb novel, asking some big questions of his characters and readers both, while never stumbling over a soap box or losing the narrative drive. A SONG OF SHADOWS is an enthralling book, crime fiction of the highest calibre, possibly Connolly's best in an outstanding series. Powered by elegant and evocative prose, the Irishman tells a story that thrills and provokes in equal measure. I found myself revisiting my thoughts surrounding the Holocaust in a number of ways (just to clarify - there's no Holocaust denial here, just reconsiderations of what the rest of the world did or didn't do at the time and afterwards, and what we teach following generations). Like a well-aged whiskey, Connolly has produced something that is smooth but also complex, multi-layered and leaves an impression after it's been consumed. An intoxicating novel, from the very top shelf. Slainte!